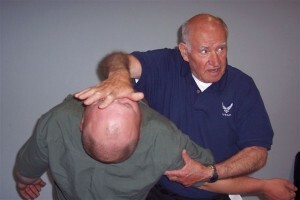 Soke Ben Mängels is the founder and honorary life member of the South African Institute of Unarmed Combat. He started his career in 1954 as a young police officer in Durban, South Africa. He soon learned that the rough and tough sailors were a force to be reckoned with, so began his training in Kodokwan Jujitsu. He discovered that what was taught in the dojo was not how things happened in real life. Most techniques were just not effective when dealing with street-wise sailors. This prompted Soke Mängels to analyse and modify techniques to suit the reality of the streets and dockyards of Durban. Keeping It Real has always been Soke Mängels’s central philosophy. Soon after obtaining his black belt in Kodokwan Jujitsu, he obtained a black belt in Judo, and became a South African middleweight Judo champion. Soke Mängels then progressed to Karate, obtaining a black began Shotokan Karate. Here he was frustrated with Karate’s inability to deal with a grappler or competent Jujitsu or Judo fighter (years later kick-boxers would have the same problem when confronted with Brazillian Jiu-Jitsu). The solution for Soke Mängels was to develop his own system, so taking the best from various Martial Arts (Jujitsu, Karate, Judo, wrestling and boxing), he created what he now calls Atemi-Jujitsu. Soke Mängels used to say that his system was best described as “Street” Karate; a fighting system that could be used in real life situations. Soke Mängels became an officer in the South African Police and Captain in the South African Air Force. He was at times the chief Close Quarters Combat (CQB) instructor to elite special forces units, including the South African Army Commandos, South African Naval Marines, and British Special Air Service (SAS). In 1981, Soke Mängels established the South African Institute of Unarmed Combat (SAIUC) in Port Elizabeth, South Africa, establishing several schools (dojos) in South Africa. When Soke Mängels emigrated to the US he handed the SAIUC over to Shihan Thaya Moodaley (7th Dan Atemi-Jujitsu) who had been training with him for almost a quarter of a century. Soke Ben’s resume is impressive: he was appointed National Director of the International Combat Military Advisors Group (ICMAG) (an international body of ex-specialist servicemen that trains military and police anti-terrorist units), president of the International Association of Close Combat Instructors (IACCI), senior advisor to the American Martial Arts Association (AMAA) and representative for South African to the Combat Military Advisors Group. The World British Federation of Martial Arts recently promoted Captain Ben Mangels, to 10th Dan in Jiu-Jitsu. Ben has also been inducted into the US Martial Arts Hall of Fame. Soke Ben teaches that unarmed combat does not make someone unbeatable. He compares it to being thrown overboard, you might not be a strong swimmer capable of swimming to shore, but if you have had some basic swimming training you might be able to hold out until rescued, With some training, your odds of surviving are better than if you had no training at all.